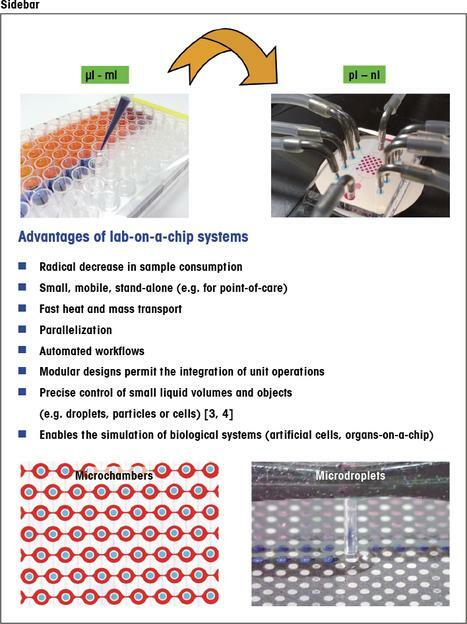 Reducing time, costs and human resources: many basic as well as applied analytical and diagnostic challenges can be performed on lab-on-a-chip systems. They enable sample quantities to be reduced, work steps to be automated and completed in parallel, and are ideal for combination with highly sensitive analytical methods. The Bioanalytics Group at ETH Zurich specializes in the development of innovative lab-on-a-chip technologies and their broad-based application to tackle biological and diagnostic issues. Fig. 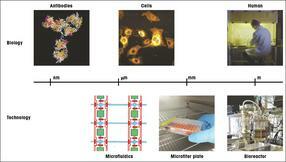 1 Conventional and microfluidic instruments for the incubation and analysis of living cells. Many biochemical and biological tests are nowadays performed using microtiter plates with 96 or 384 sample wells. Alterations in concentrations or reaction conditions allow for the creation of systematic analysis series. The sample and reagent volume used for these tests typically ranges between 10 μl and a few 100 μl (Fig. 1). 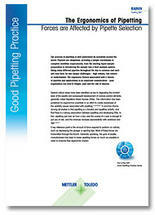 This approach often involves numerous time-consuming work steps, including pipetting, which implicates high error rates. With increasing test trials, resource requirements (time and personnel) rise accordingly. 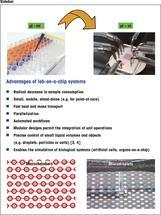 Microfl uidic or “lab-on-a-chip” systems enable to decrease the required sample and reagent volumes by several orders of magnitude and thus, in turn, drastically reduce per-test costs while simultaneously permitting a wide range of experiments to be performed in parallel within a single chip device (sidebar) . Using photolithographic processes and most recently also 3D printing processes a wide range of fluidic operations can be combined on a single, cost-effective microfluidic chip with a footprint of just a few square centimeters (Fig. 2). The spectrum of the integrated modules commences at simple channels with dimensions ranging from 1 to 500 μm, which guide a sample solution to a sensor or detector, and continues to highly complex systems, in which various operations such as washing or segmentation steps succeed fully automated and in parallel for hundreds of samples at once . Besides channels and reaction chambers, today’s chips also include active elements such as valves and pumps, which permit synchronized high-precision mixing and the measurement of dynamic processes (kinetics) at high time resolutions. The most commonly used chip materials (glass and polymers) are transparent and hence ideally match optical measurement methods. Furthermore, interfaces for microfluidic systems and other analytical methods, such as mass spectrometry, have been developed recently . Fig. 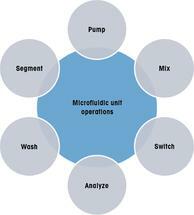 2 A selection of microfluidic unit operations. The use of valves or the creation of segmented flows – an approach known as “droplet microfluidics” – allows for reproducible generation of tiniest volumes, right down to the scale of picoliters and nanoliters . Valves isolate small chambers, which are ideally suited for cell capture and culture among others. This enables long-term observations of living cells, while they are systematically exposed to test substances. The fluid exchange in such chambers occurs in a split second (Fig. 3). The valve geometries and the valve arrangements define the chamber volumes. Hence, volumes in the nano- or picoliter range are reproducibly metered. 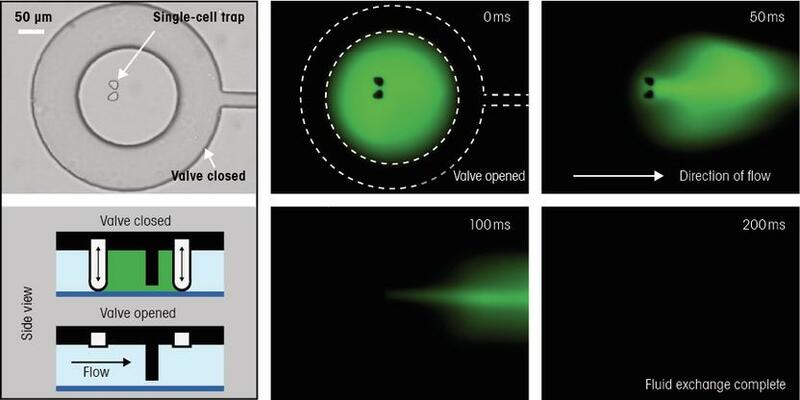 In contrast to the use of valves, techniques based on droplet microfluidics continuously create small volumes by injecting an aqueous solution into a stream of an immiscible liquid phase [3, 4]. The droplet generation operates stable over hours as well as at high frequencies up to the kHz range, which renders this strategy particularly useful for high-throughput analyses. Fig. 3 Washing step on-chip: the presented microfluidic chip contains integrated, round valves comprised of circular ring-shaped stamps that are pressed into the channel, thereby forming tiny chambers. Upon valve actuation, a volume of a few hundred picolitres is enclosed. The opening and closing of the valve permits complete fluid exchange within approximately 200ms, which can be used in single-cell analysis for supplying fresh growth medium, for example, or as a washing step. The image sequence illustrates an enclosed fluorescent fluid that is exchanged by an externally flowing non- fluorescent buffer solution upon valve opening. The analysis of biological samples, i.e. bacteria or cell cultures, within ultra-small volumes provides detailed insights into a wide range of biological processes. The approaches are useful in numerous applications, such as toxicity analyses, drug development, biotechnology, and many other fields in industry. Moreover, single cells can be isolated in such tiny volumes and individually analyzed. Using this new approach of single-cell analysis, researchers hope to gain valuable information for systems biology, especially regarding individual cell behavior and adaptive properties. In our lab, we deploy a combination of highly sensitive fluorescence microscopy and microfluidic chips. The example in Figure 4 shows how the individual cell response (here: increase of the second messenger cyclic adenosine monophosphate, cAMP) is determined after stimulation with a hormone (here: luteinizing hormone). In this method, individual cells (here: the tumor cell line MLTC) are first immobilized in an array of miniature chambers. This is achieved by cell traps that are positioned in the channel. The traps consist of two columns spaced a short distance apart so that exactly one cell can be captured between these columns, while other cells pass by already occupied cell traps. A series of sequential stimulation and washing steps is conducted afterwards. The cells are subsequently lysed and the round valves are actuated, enclosing the lysate within a volume of 500 picoliters. The amount of cAMP is determined using a competitive immunoassay, in which the released cAMP binds to specific antibodies. This method allows for the generation of a dose-response curve, which provides the mean response of many cells (red symbols) as well as the values of individual cells (black symbols) (graph in Fig. 4). The results depict the strong heterogeneity of cell response, thereby emphasizing the unique relevance of single-cell analysis . Fig. 4 Determination of a dose-response curve for individual cells by applying an antibody-based detection method (ELISA – enzyme-linked immunosorbent assay). The cells are captured by a cell trap, lysed, and analyzed. The addition of a stimulating agent either occurs before injection into the chip or after cell trapping (data from  reproduced with permission, copyright ACS). Microfluidic technology already significantly contributes to bioanalytics and provides innovative solutions for fundamental research. Moreover, the development of microfluidic diagnostic tests comprises large potential, for instance for personalized medicine. Miniaturized analytical methods combined with simple and costeffective fluidic chips will enable the operation of complex biological and chemical tests online and on demand as well as almost anywhere in the world . Microfluidic systems furthermore render tissue engineering (“organ-on-a-chip”) possible in order to simulate the physiological cell environment, thus providing detailed and realistic insights concerning the progression of disease or drug metabolism (pharmacokinetics) . The short measurement time coupled with massive parallelization delivers results faster and more cost-effectively than conventional tests, and additionally offers improvements to the standardization of cell-based assays. First publication: Dittrich, P. S., Armbrecht, L., Kurth, F., q&more, 1.2016.